Executive director of the National Immigration Law Center (NILC), Marielena Hincapié is one of the nation’s leading voices on immigration policy and social justice. 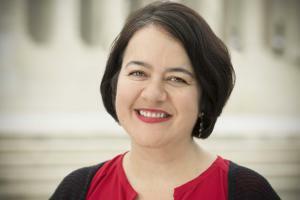 Part of the University of Hawai‘i at Mānoa’s Better Tomorrow Speaker Series, her public address “From Resistance to Resilience: A New Vision for Immigration and Justice,” will be held on Friday, April 26, 7 p.m. in UH Mānoa’s Architecture Auditorium. A tenacious opponent of the Trump administration’s policy on family separation and refugee refusal, Hincapié will be speaking on both national opposition to immigration exclusion, as well as the progress made on immigrant protection at the state and municipal level—with Hawai‘i leading the way. The event is free and open to the public. Seating is on a first-come, first-served basis. On-campus parking is available for $6. Under Hincapié’s leadership, the NILC has emerged as a major force for progressive immigration reform. Combining litigation, advocacy, communications and alliance-building, the NILC led the legal challenges to Trump’s Muslim ban and to the termination of Deferred Action for Childhood Arrivals. Hincapié is now leading a 50-state campaign for local immigrant protection and inclusion. Although the Trump era has been marked by harsh measures to build barriers, increase detention and deportation, turn away asylum speakers, and, most controversially, to separate children from parents, Hincapié contends that there is surprising room for optimism. In her first public address in Hawai‘i, she will outline a bold proposal for the path forward, including what communities, states and the nation can do to draft a blueprint for a more just and inclusive country. Hincapié’s talk is presented by UH Mānoa’s College of Social Sciences, Better Tomorrow Speaker Series, Scholars Strategy Network and the Hawai‘i Community Foundation. Additional sponsors include the Department of Geography and Environment, Department of Sociology, UH Foundation, and the William S. Richardson School of Law. The Hawai‘i ACLU has also provided support. Media interviews: A practiced litigator in the federal courts, Hincapié makes regular appearances on national television and radio. She is available to speak on renewed efforts to oppose the Trump administration’s anti-immigrant policies, as well as the work she has done in Hawai‘i in cooperation with the ACLU and the Office of the Attorney General. She is open to solo appearances or to interviews in conjunction with local immigration advocates, who can provide fuller context on how Hawai‘i fits into the national landscape.